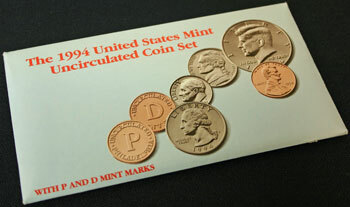 A pale blue envelope held the 1994 mint set and showed images of the five coins and two mint tokens on the front. 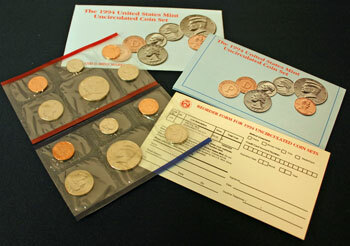 The mint set contained ten uncirculated coins, five from Denver and five from Philadelphia. 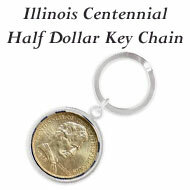 The five uncirculated coins were the Kennedy half dollar, Washington quarter, Roosevelt dime, Jefferson nickel and Lincoln penny. On the 1994 mint set envelope the five coins and two mint tokens appear to have been tossed diagonally across the front. 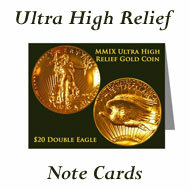 Along the top of the envelope in red letters, the mint set is identified by "The 1994 United States Mint Uncirculated Coin Set." In the lower left corner, "with P and D mint marks" alerts the collector that the uncirculated coins in the mint set come from both the Denver and Philadelphia mints. 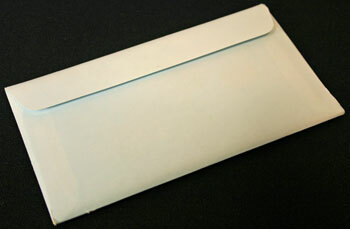 The back of the mint set envelope is a simple pale blue with no further identifying design or text. 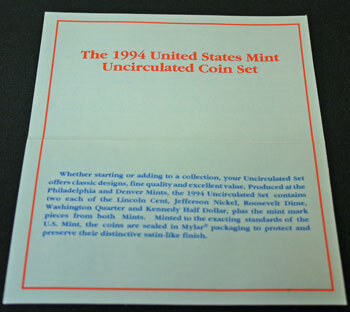 The contents of the 1994 mint set include the two clear sleeves holding the uncirculated coins and mint tokens, an informational insert about the mint set and a reorder form on a separate card. The uncirculated coins on the left come from the Denver mint as noted by the red edges and the "D" mint token. The blue edges and the "P" mint token identify the coins on the right as being from Philadelphia. 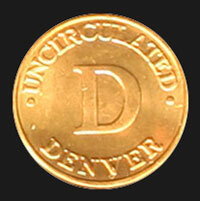 In a close-up view, the Denver mint token simply shows "Uncirculated" and "Denver" around the rim with a large "D" in the middle on its obverse. 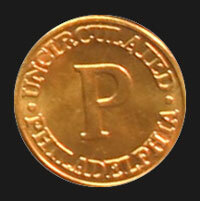 The Philadelphia mint token, like the one from Denver, shows "Uncirculated" and "Philadelphia" around the edge and a large "P" in the middle. 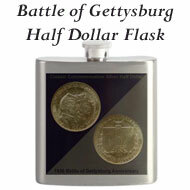 Each clear sleeve contains six sealed compartments to hold and protect the five coins and the one mint token. The six separate sections prevent the coins from rubbing against each other but allow the uncirculated coins to move freely within each space. Each sleeve is clear - front and back. 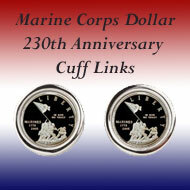 Turning the sleeves over shows the reverse images of the uncirculated coins. 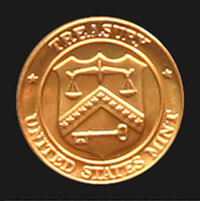 Both of the mint tokens have the same reverse image which includes the Treasury Department's seal for the US Mint. The front of the informational insert looks almost, but not quite, the same as the front of the 1994 mint set. Inside the folded insert, the US Mint's message about the 1994 mint is the same as the previous year's mint set, except the year was changed from "1993" to "1994." The color and font size are different, but the words are the same. 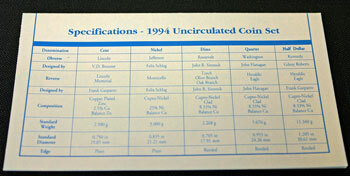 In blue font, the back of the folded insert is titled "Specifications — 1994 Uncirculated Coin Set." 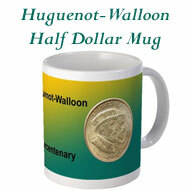 The coin specifications include the artists, the size, the metals and the weight of the five uncirculated coins in the mint set shown in a blue grid on a light blue background. Larger images of the 1994 mint set insert show the contents of the insert and the coin specifications with more detail. Many consider the World Cup Soccer event this summer will be a non-event. Along those same lines, the US Mint's judging panel for the designs of the commemorative World Cup coins did not expect many entries. They were surprised to find over 1400 entries submitted by more than 1200 artists. The panel had just eight hours to review and judge the 1400+ entries. An Iowa metals recycler obtained nickel scraps from a Russian processing plant. This nickel was in turn sold to the US Mint. 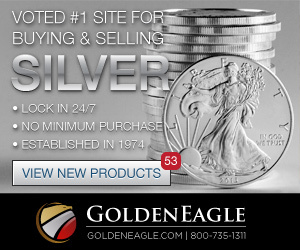 Though legislation requires the US Mint to purchase the metal in the US, the origin of the metal can be global since the US has very little nickel mining activity. Penny shortages exist in Columbus and Cincinnati but have not appeared in Toledo yet. The Fifth Third Bank in Cincinnati is asking customers to bring in their pennies to help with the shortage. The Federal Reserve Bank in Cleveland said that 132 billion pennies were in circulation in 1990, the US Mint has added 30 to 40 billion more for 1991 through 1993. While the custodians of Jefferson's homes - Monticello and Poplar Forest - utilize the $6 million raised by the sales of the commemorative coins, the US Mint continues to search for Jefferson's coin collection. He collected coins on his travels abroad. 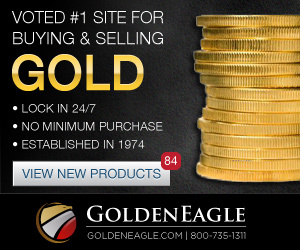 He gave the coins to Benjamin Franklin's Philosopher's Society, but in 1967, the coins were sold to an antiques dealer in Philadelphia. He died leaving very few records and no trace has been found of the coins. 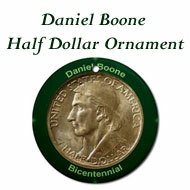 The Federal Reserve Bank of Boston began rationing pennies. People place their pennies in jars rather than carry them, and the hoarding problem is compounded by banks refusing to accept loose pennies - only rolled coins. Meanwhile, the US Mint is operating at full capacity with 80% of its production dedicated to pennies. 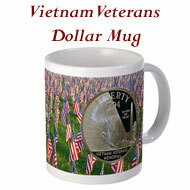 On July 29, the US Mint began selling three commemorative silver dollars recognizing American veterans. 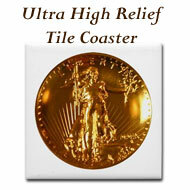 Surcharges from the coins will provide funds to three specific veterans memorial projects. 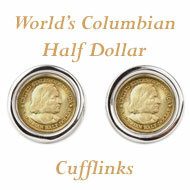 At $10 per coin, the surcharges could bring as much as $410 million. The proceeds will help repair the Vietnam Veterans Memorial, create a memorial for American military women and establish a national POW museum in Andersonville, Georgia. Organizers for the Atlanta Olympic Games say that the Olympic coins to be available from the US Mint next year will be the largest series ever produced by the mint. 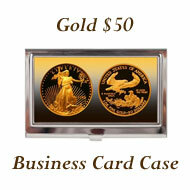 The 16-coin series includes four $5 gold coins, eight $1 silver coins and four cupronickel half dollar coins. 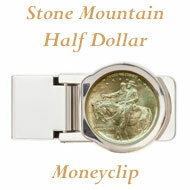 The coins will be available from the US Mint and at branches of Nationsbank, a sponsor of the games. The 1994 Mint Set Year included news of a new penny shortage, the design of the soccer commemorative and a variety of other commemorative coins.